Indian food is popular the world over. Certainly it's one of the best-prepared options here in Ireland, just about the only thing worth going out for. Perhaps due to this popularity, there is a great deal of misinformation surrounding this cuisine. Here I will cover some general points, but must first declare that, though I am half-Indian, I have never been to that country. All my knowledge comes second-hand -- a pretty close second-hand in some cases, but still. The first point is that the food one gets in an Indian restaurant is not at all similar to the food one would traditionally get on the streets of India. What we have instead are versions of the feast food people would have eaten on special occasions when, for instance, they would splurge on meat in addition to their diet of pulses and rice. But not that food either, but rather that sort of thing filtered through the English colonial tradition and the vibrant Indian communities in the UK. Oh, not even that either but something far more often a Pakistani or Bangladeshi take on Indian food1. Because few Western consumers would venture into a Pakistani restaurant, but label it "Indian" and it doesn't matter where all the cooks and staff are from. Confused yet? Add to that the fact that millions of Indians are now (and have been for some time) well-travelled and well-to-do and have brought versions of their own food back from England and beyond. They can afford meat whenever they like and naturally have refrigeration to keep items safe for a time. Thus they no longer need to eat only things that keep well in the heat or can be prepared freshly and eaten immediately2. The most popular Indian dish in this part of the world is Chicken Tikka Masala, which is about as Indian as sausage and chips. As near as I can tell, it was invented in Soho, London. Some brilliant person decided to put tikka chicken (which is first marinated, then cooked in the tandoor3) into a sauce and cook it a second time. Voila! But there is no point being a purist when it comes to Indian food. The Indians sure aren't. For example, some time ago Chinese food became rather popular throughout the subcontinent, so now there are a good number of Indian dishes containing soy and other typically Chinese ingredients. You might even find sweet and sour chicken in India... but it will be a very distinctive version! Maybe transmuted into sweet and sour paneer4 instead. I have had this and it was... unique. The last main point is that every region in India is different. There are hundreds of regions, each with a different mixes of religion, caste, class, industrialisation, climate, language and so on. And each has a variant on the cuisine, with many ingredients -- fish, fruit, vegetables and so on -- being distinct5. You will rarely find these on a menu since Indian restaurant food has been highly standardised. The most obvious and extreme example of this is that almost no Southern Indian food exists outside of India and some parts of England6. 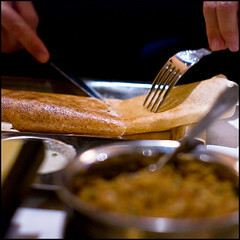 But obtain ingredients at your local Indian grocer and you can try out new dishes for yourself. My next article will cover a couple of fundamentals to get you going. 1 For some reason to do with immigration I have found a lot more Bangladeshi cooks in Canada and Pakistani in Ireland. But maybe my statistical sampling is skewed. 2 That is kind of a shame because it is at the heart of Indian cuisine. Think about it: little or no dairy, clarified butter, young yoghurt, spices to keep meat. 3 The tandoor is a large clay oven that cooks at a very high temperature. It is not only Indian but used all over the Persian-influenced area. Meat and other items are put on spits and inserted inside on an angle. Naan bread is stuck directly to the walls. Cooks operating these ovens have no arm hair and a high tolerance to burns. Really. 4 Paneer is a cheese curd made without rennet (thus vegetarian-friendly) that holds its firmness in a dish. Not everyone likes it, but if you are fond of firm tofu you are a good candidate. I find it inoffensive. 5 There are hundreds of varieties of mango for instance, with at least a dozen being popular. How many have you tried? 6 There is only one Southern Indian restaurant in Ireland, but luckily it is just down the street.